As I enter the Wallis Annenberg Center For The Performing Arts in Beverly Hills, I find a party atmosphere on the Promenade Terrace. What’s this? A gathering of multi-generational people, music blaring, and a basketball thrown at me from a make-shift court. Okay, I’m game for the game as I shimmy over to the “basket” and fail miserably (several times) to score a goal. I blame it on my high-heels. Was I expecting this much fun and celebration? No –this was supposed to be a dramatic, angry, somewhat political theatrical play. It was. But the first half-hour was an entertaining, fun, outdoor gathering that sets the stage for “The Bitter Game” an inter-active theatrical experience. And a very personal one at that. Playwright-actor Keith A. Wallace performs a one-man show, telling the story of Jamel Smith. Wallace is extremely likable and charismatic. As a young boy, Jamel witnesses a neighborhood act of violence. With the direction of his mother, he (and the audience) are guided on the do’s and don’ts of being an African-America in America. The lecture he receives is a poignant reminder of the struggle that still exists today among young Black men as they navigate their interaction with police and society. “When you are in an elevator with a White woman, she will clutch her purse,” says his mother. “But, you stand by her side so she can see you and soften your face.” Wow — the audience is silent, mesmerized by a truth that is so hard to swallow. “The Bitter Game” is based on Wallace’s youth in Philadelphia, is created, written and performed by Wallace, co-created by Deborah Stein, and directed by Malika Oyetimein. The 50-minute production was engaging , thought-provoking with laughter, tears and stirs provocation. It is an important and entertaining theatrical experience appropriate for all ages. Although there is some adult language, but not too bad (nothing kids haven’t heard already). Wallace hopes the play will eventually reach beyond the theater to be used as a tool of sensitivity training for law enforcement and performed with schools and communities reflected in the story. I do too and so should you by the time the play is over. THE BITTER GAME was commissioned by the La Jolla Playhouse for the International WOW Festival while Wallace was still a graduate student at UC San Diego. 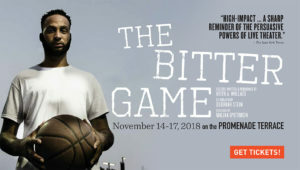 Since its debut, THE BITTER GAME has received critical acclaim not only from The New York Times but also the Los Angeles Times and the San Diego Tribune, which called it “a searing, well-honed one-man show,” and others. It has toured internationally, making notable stops at the Skirball Cultural Center, The Public Theater, The Kennedy Center, The American Repertory Theater and the Dublin Theater Festival. The play also won the 2016 Princess Grace Theater Award and was a semi-finalist in the 2016 Sundance Theater Lab and the Eugene O’Neill Playwrights Conference. Warm attire and comfortable shoes suggested. DEBORAH STEIN (Co-Creator) is a playwright, director, and collaborative theatre maker. Her play Marginal Loss recently premiered at the Actors Theatre of Louisville Humana Festival. Other recent projects include The Wholehearted (world premiere at the Kirk Douglas/Center Theatre Group and La Jolla Playhouse) and Chimera (Under the Radar; Gate Theatre in London; Drama Desk nominee for Best Solo Performance). Stein’s other plays include God Save Gertrude (Theatre @ Boston Court, Workhaus Collective), Wallflower (Stages Rep), andBone Portraits (Walkerspace, Live Girls!). She has worked extensively with some of the country’s leading devised theatre makers including Joseph Chaikin, Dominique Serrand, Lear deBessonet and most frequently the Pig Iron Theatre Company, with whom she created six original plays. Her writing has been published in Theatre Forum, Play: A Journal of Plays, and The Best American Poetry. Currently on faculty at UC San Diego, she has also taught writing and collaboration at Yale School of Drama, NYU/Tisch, Princeton, Northeastern, St. Olaf, Parsons and Brown (where she received her MFA, advised by Paula Vogel). An alumna of New Dramatists, she has received other grants and awards including NEFA National Theatre Project, New York State Council for the Arts, Bush Artist Fellowship, two Jerome Fellowships and a McKnight Advancement Grant at the Playwrights’ Center in Minneapolis. Stein teaches at UC San Diego, where her collaboration with Wallace began. MALIKA OYETIMEIN (Director) recently completed her MFA at the University of Washington’s School of Drama and is a member of the Directors Lab at Lincoln Center Theater. In Seattle, she was featured in City Art Magazine’s 2016 Future List and her productions (Bootycandy, 2016) and (Hoodoo Love, 2017) have been nominated for Gregory Awards: Best Production. She recently was the co adapter and director of Dr. Maya Angelou’s I Know why the Caged Bird Sings. Among her directing credits are the world premiere ofWHITE (Theatre Horizon), Milk Like Sugar (Artswest Playhouse and Gallery), Barbecue, Bootycandy (Intiman Theatre Festival), Goin’ Someplace Special (Book-It Theatre Co.) Hoodoo Love (Sound Theatre Company, Yancy Girl Productions and Ademide Theatre Ensemble), Young Voices (InterAct Theatre Co. and Philadelphia Young Playwrights), and Topdog/Underdog (GoKash Productions). Among her assistant director credits are THE BITTER GAME (Public Theatre/Under the Radar Festival), Threepenny Opera, Blue Door(Arden Theatre Co.), and A View from the Bridge (Oregon Shakespeare Festival). As a professional teaching artist, Oyetimein has worked with: Seattle Repertory Theatre, Philadelphia Young Playwrights, Arden Theatre Co., Mural Arts: Project Home and Theatre Horizon’s Autism Drama Program. PLATO SETO (Stage Manager) Broadway: Saint Joan, The Children, Prince of Broadway. Off-Broadway: Sugar in Our Wounds, In the Body of the World, The Portuguese Kid. Other New York: Pick a Color (Dixon Place), Nan and the Lower Body: The Pap Smear Play (MTC).Regional: Beetlejuice (National Theatre, Pre-Broadway Engagement), THE BITTER GAME (Skirball Cultural Center & La Jolla Playhouse: WOW Presentation ’16 & WOW Festival ’15), Blurred Borders Dance Festival #17 (Rincon Dance Collective), John Leguizamo: Latin History for Morons (La Jolla Playhouse), Lilith (Calit2 Theater), Broadway in Your Backyard (La Jolla Playhouse), In Your Arms (The Old Globe), Up Here (La Jolla Playhouse), and various corporate events. Seto has been a part of THE BITTER GAME‘s journey since its beginning. She holds a BA in Theatre from the University of California, San Diego. KEISHA A. WALLACE (Signed English Performer) is a Philadelphia native and first year ASL/English Interpreting student at The Community College of Philadelphia. She has received a Dual Baccalaureate Degree in Special Education/Elementary Education with a Minor in Deaf Studies. Her passion resides in communicating with the Deaf Community and working to effectively break communication barriers. Wallace has been actively involved within the Deaf Community and Deaf Culture in various ways, including local events within the city of Philadelphia and surrounding counties as well as volunteerism with The Annual Philadelphia AIDS Walk, Pennsylvania School for the Deaf (PSD) and Deaf-Hearing Communication Centre (DHCC).